Hempz NATURALLY HEMPZ Natural Maximizer – 9 oz. This deeply replenishing dark tanning formula is packed with nutrient-rich 100% Pure Natural Hemp Seed Oil. This lotion helps your skin retain an even moisture level with Natural Botanicals such as Green Tea, Pomegranate and Carrot Seed Oil, as well as nourishing Shea Butter. Ecobronze Technology helps stimulate dark tanning for deeper, richer more natural results. Natural Botanical Antioxidants of Green Tea, Pomegranate and Carrot Seed Oil help protect the skin from environmental stressors while providing smoother, younger looking and healthier skin. Paraben Free, Gluten Free, 100% Vegan, Sustainable and Organic Ingredients. Supre ISLAND TIME Dark Tanning Maximizer – 13.5 oz. Specially designed to enhance your tan for that perfect bronze hue. let this skin conditioning and toning blend of Honey, Coconut Water and Papaya help keep you hydrated for smoother, firmer, younger looking skin while achieving gorgeous color. Dark Tanning Maximizers including Tyrosine help to enhance your tan for darker, longer lasting results. Skin conditioning Honey helps nourish and hydrate leaving skin feeling soft, silky and smooth. Refreshing Coconut Water and Papaya help skin appear firmer and more toned while giving it a radiant glow. Antioxidants plus Vitamins A, C and E help protect skin against free radicals and photo aging. If you’re a fashionista, the word “couture” surely sets your heart aflutter. You know that couture brands offer what others don’t–true luxury. You appreciate quality. A couture handbag or pair of pumps isn’t just better because of its fancy name; it’s made with better materials and closer attention to detail than other accessories. You simply can’t rival the quality of beautiful couture pieces, so why settle for anything less? When it comes to tanning, there are a select few products that are made with quality and luxury and mind. These formulas are the couture items in the world of tanning, and if you really want to treat yourself to the very best, these are the bronzers for you. Supre Tan Snooki Ultra Chic Black Bronzer Couture is one such formula and one of the latest products to be released from the skin care experts at Supre Tan and “Jersey Shore” star Snooki. The bronzer is ultra effective and ultra pampering, and perfect for the lady who knows that she deserves the best. 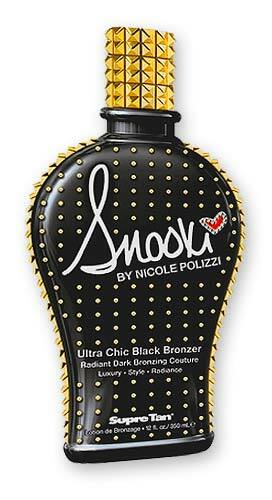 Supre Tan Snooki Ultra Chic Black Bronzer Couture offers the best of tanning results because it has a very unique tanning complex. To create the formula, Supre Tan has added their finest natural bronzers, ingredients that enhance your skin’s natural ability to produce gorgeous color. It’s these bronzers that help your skin get as dark as possible when you’re in the tanning bed. The lotion also contains a blend of cosmetic bronzers that bring additional color to the skin, so that your tan really wows. Along with its tanning ingredients, the bronzer has a huge dose of anti-aging skin care extracts and technologies as well as soothing moisturizers. TanForLess lets you treat yourself to pampering and a gorgeous tan for less than the price you’d pay for Supre Tan Snooki Ultra Chic Black Bronzer Couture at your local tanning salon. That means you can turn heads and still have money left over to get that couture accessory you’ve been eyeing. It’s a fact: you can have a less-than-lean profile no matter how much you weigh. Cellulite and sagging skin don’t discriminate. Even women with healthy BMIs can have skin that hangs or has an unpleasant orange peel texture. When your skin is tanned, trouble tissue often looks better and smoother, but the UV exposure from tanning can exacerbate cellulite and sagging skin problems. This is because the intense energy actually weakens collagen fibers, making the skin less firm and more prone to unevenness in the presence of even small amounts of stored body fat. But never fear–you can tan and address the problem spots that make you appear less trim with the help of Supre Tan Snooki Skinny Bronzer. Supre Tan Snooki Skinny Bronzer contains a new Fit & Firm complex. This proprietary blend of ingredients was developed by the brand’s scientists and Snooki from “Jersey Shore” to help address areas of sagging and cellulite. With regular use, the bronzer can lead to visible improvements in the texture of the skin, so that it looks and feels firmer. Cellulite can also be diminished with this breakthrough ingredient blend, giving you the confidence to show off your gorgeous tan. Not just a skin firming treatment, Supre Tan Snooki Skinny Bronzer is also a powerful bronzer. The formula includes tan maximizers that amplify your cellular abilities to respond to UV light and produce melanin. The scientific maximizers encourage pigment production at accelerated rates for skin that is far more golden once tanning ends. DHA then takes over the tanning process and pushes your color even deeper while helping it to last as long as possible. With Supre Tan Snooki Skinny Bronzer, you’ll be a lean, mean tanning machine and get the benefits of firmer skin and a healthy, dark glow. Check out the formula here at TanForLess, where you’ll always pay less than tanning salon prices. Everyone has been anticipating what will be next in the Snooki tanning collection from Supre Tan. This line of tanning products has received rave reviews since it was first released. What makes the range so unique is that it combines the expert knowledge of the scientists and skin care experts at Supre Tan with the practical experience and feedback of Snooki, who is widely known for having a great tan. Together, the team develops products that eliminate common problems related to tanning and that provide superior results to others on the market. Finally, the wait for Supre Tan products is over! The line is finally released, and we already have a few favorites from the collection. Supre Tan Snooki Skinny Streak Free Bronzer is definitely one of them, as we love how it tackles a common tanning problem–streaks! Those pesky lines are usually caused by cosmetic bronzers in tanning lotions. For some women, the condition of their skin makes it difficult for bronzers to become properly absorbed, and as a result, areas appear darker than others. The new bronzer from Snooki and Supre Tan eliminates the risk of this because it doesn’t contain cosmetic bronzers. Many women who suffer from frequent streaking when tanning continue to use cosmetic bronzer formulas because they can’t get dark results with ordinary products. Supre Tan Snooki Skinny Streak Free Bronzer is formulated to fix that problem. It contains very powerful natural bronzers that produce maximum results in response to UV exposure, so you don’t have to compromise the depth of your color to avoid streaks. The formula also contains Supre Tan’s new Fit & Firm complex. You’ll love how these ingredients reduce sagging skin and cellulite, and when your skin texture improves, you’re less likely to develop streaks with any tanner. Supre Tan Snooki Skinny Streak Free Bronzer is now available for purchase right here at TanForLess. We’ve specially priced the formula to make getting a gorgeous, streak-free tan as affordable as it is easy! For a girl who loves a golden glow, nothing is more frustrating than reaching a tanning plateau. A plateau is the fancy term for color that reaches a certain point and then stops darkening. Many women who are frequent tanners eventually reach a plateau, and find it difficult to continue seeing results. If you’ve found yourself stuck in a tanning plateau, don’t give up on tanning, just try a new tanning lotion meant to bust plateaus. Supre Tan has recently released one such plateau buster with the help of Snooki from “Jersey Shore.” Supre Tan Snooki Skinny Hot Maximizer is a breakthrough formula that uses a hot tanning complex to restart tanning results. The complex warms the skin on contact, and you’ll see that your skin starts to become red within a few moments of application. That redness develops because of increased blood flowing to your skin tissue, and increased blood means more oxygen is reaching your skin cells. Oxygen wakes up your skin cells and gets them ready to respond to UV. When your tanning session starts, your skin begins to darken almost immediately instead of taking several minutes to respond to the tanning bed. Along with the hot complex, Supre Tan Snooki Skinny Hot Maximizer contains dark tanning maximizers, ingredients that help the skin cells produce pigment as quickly as they can. As a result, your skin will end up with more melanin at the end of your session than you’d get from tanning bare skin alone. A Fit & Firm complex is found in the formula to help restore elasticity to skin that is prone to wrinkling, sagging and cellulite. Snooki has also added a Tattoo Protector to keep body art looking great. If you’re sick of being stuck in a tanning plateau, it’s time to try Supre Tan Snooki Skinny Hot Maximizer! You can order a bottle at TanForLess for a discounted price.